Glass fill rubies are they today rubies or glass stones? This question is one of the biggest questions in today’s ever changing society of Colored gemstones, especially when it comes to the king of gems: Rubies. Many real examples like Coke and water, if there is more water than coke should be still called Coke? Apart from what it should be called, the question is what it is called, its still called Coke, right? Yes. But what is ethical? What is acceptable? Where is the line? The problem in today’s Gemstone market is that there is organization which mixes Science and Gemology into the actual trade of Gems & Jewellery. Some organizations like gia.edu reach to an extent where they can classify synthetic / naturals / treatments, but what about a WTO for gemstones instead of food? After all, Gems and Jewelery is worn and can be dangerous, effect peopleshealths. Today’s biggest question is whether the glass fill rubies are rubies with glass filling or glass with ruby in it? Either way there is always a mixture, otherwise it wouldn’t be called Glass fill ruby. Padparadscha Sapphire – what is the real meaning? The real meaning is when the sapphire gives a perfect 50%-50% ratio of Pink and Orange and it gives a Peachy look to the Stones. When this happens, it makes the perfect Padparasdscha and infact the right term. Today’s low availability of this type of a sapphire makes it almost a very difficult call because when you barely see the 50-50 ratio then how are you going to judge whether the standard which is non existent today, still is the benchmark or not? Similarly in Rubies, when they started to use Glass fill rubies in the market on a commercial level, the Thai manufacturers started with 10% glass fill. As time passed and competition increased, price pressured seemed high, sellers wanted to sell, everyone started to look for newer ways to increase their sales. Now some thai’s came up with this Glass filling upto 80% in the natural ruby to make it look like even a better color ruby, less inclusions etc. 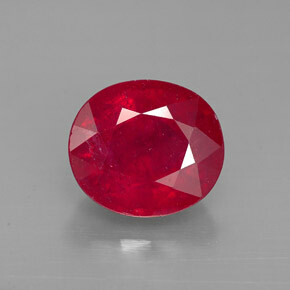 There came to a point in history, still available today, where we think to ourselves – really, is this glass or ruby? In conclusion, there is a very fine line that divides these things, and according to us it should have glass not more than 50% in the ruby, otherwise its more glass than ruby and becomes quite highly doubt able and questionable whether we still call it ruby or glass?